Product Description: The book is a collection of the author's selected works in the philosophy and history of logic and mathematics. Papers in Part I include both general surveys of contemporary philosophy of mathematics as well as studies devoted to specialized topics, like Cantor's philosophy of set theory, the Church thesis and its epistemological status, the history of the philosophical background of the concept of number, the structuralist epistemology of mathematics and the phenomenological philosophy of mathematics. Part II contains essays in the history of logic and mathematics. 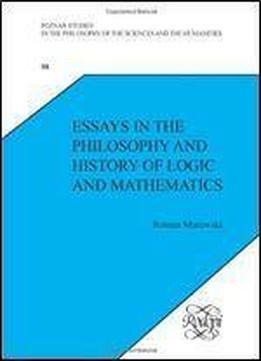 They address such issues as the philosophical background of the development of symbolism in mathematical logic, Giuseppe Peano and his role in the creation of contemporary logical symbolism, Emil L. Post's works in mathematical logic and recursion theory, the formalist school in the foundations of mathematics and the algebra of logic in England in the 19th century. The history of mathematics and logic in Poland is also considered. This volume is of interest to historians and philosophers of science and mathematics as well as to logicians and mathematicians interested in the philosophy and history of their fields.